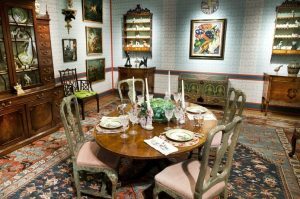 The recent sale of the Peggy and David Rockefeller Collection at Christie’s in New York raised a compelling set of questions for “Home Subjects.” Although we are usually focused on Britain art, we have regularly considered questions of domesticity and display in an international or transatlantic context. 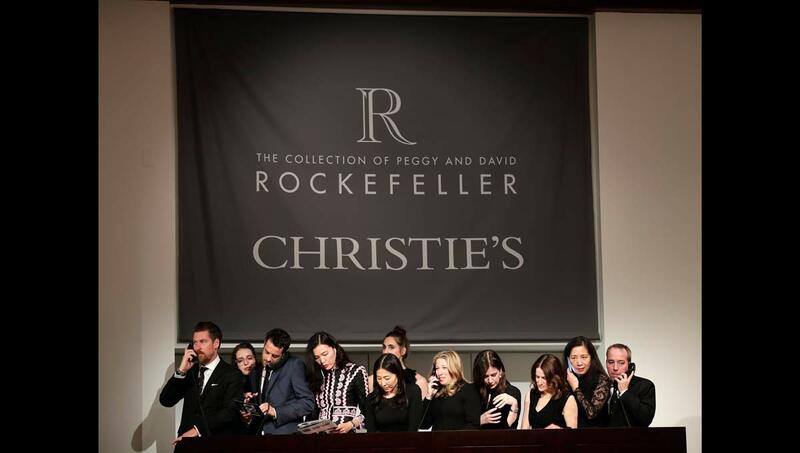 And the issues raised by the Rockefeller collection, its domestic display, and its marketing by Christie’s are too good to miss. There is a reason that Jay-Z decided to pun on the name when he co-founded Roc-a-fella Records: the Rockefellers were synonymous with wealth and privilege. The heir to Standard Oil was born not only into great wealth but also a large family of long-standing cultural interests. His mother Abby Aldrich Rockefeller was instrumental in the establishment of the Museum of Modern Art, and the Rockefellers were generous donors to that museum. David and Peggy Rockefeller were also passionate collectors of art—Vanity Fair hailed the sale as “the largest art auction of all time.” The Rockefellers were motivated as collectors, in part, by a comment from Marga Barr, the wife of MoMA’s founding director Alfred Barr Jr., who visited their home for tea and noticed the newlyweds’ collection of “minor” English paintings, asking “How can you stand to be surrounded by so many little men in red coats?” The Rockefellers worked with Alfred Barr to develop their collecting interests, acquiring works from the collection of Mrs. A Chester Beatty as well as working with a consortium of collectors to acquire and divide amongst themselves the collection of forty-seven works in the estate of Alice B. Toklas, companion of Gertrude Stein, that came on the market in 1968 after Toklas’s death. Picasso’s Fillette à la corbeille fleurie, acquired by Rockefeller from the Toklas estate, realized $115,000,000 at the Christie’s sale. Peggy and David Rockefeller’s Library at their East 65th Street Manhattan townhouse. Hanging on the wall is Pablo Picasso’s Fillette à la corbeille fleurie, 1905. Image: Courtesy of Christie’s, New York. The lobby gallery at Christie’s, which Frank de Biasi has outfitted with furniture, art, and decor from the Rockefeller collection ahead of its auction this May. 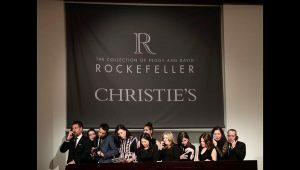 The auction house decided that it should put the art collected by the Rockefellers “in context” and hired interior decorator Frank de Biasi to evoke the Rockefeller interiors in their exhibition spaces in the preview of the sale. In particular, de Biasi had to figure out how to show off the art in relation to the “brown furniture” (the popular term of wood furniture of the eighteenth and nineteenth century). As he noted: “When furniture like this is being denigrated and underappreciated, you have to do something to create a space that will appeal to younger collectors, to show that you can use brown furniture in a contemporary setting.” The auction house was secure in its ability to market and sell the paintings, but they wanted to make the furniture attractive to a new kind of collector by evoking the domestic interior. The Rockefeller’s own interiors are well-known, and they displayed their collections amongst numerous homes, described as “well-staffed, gorgeously sited, but never ostentatious:” Hudson Pines on the Hudson River; Ringing Point, in Seal Harbor, Maine; Four Winds in Columbia County, New York; and a townhouse on East 65th Street in Manhattan. 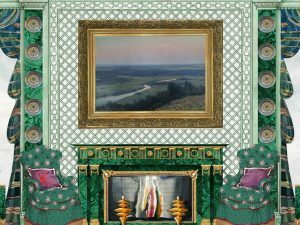 At Christie’s, the decorator has the task of evoking a domestic space redolent of the Rockefeller’s taste without actually re-creating a specific space. In particular, he had to create what he called a “central focus” in a space with no windows and no fireplace, as well as a low ceiling and track lighting. 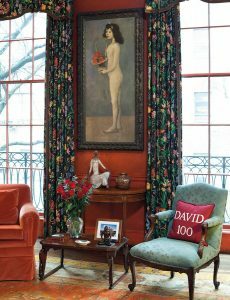 He took the Colonial Revival taste of the Rockefeller’s as a jumping off point and combined it with paintings by Gauguin and Chagall, George II Gainsborough chairs, and Chinese mirror paintings. This type of environment is a new direction for the auction house. When they have sold famous estates in the past, with broad ranging collections, like that of fashion designer Yves Saint Laurent and his partner Pierre Bergé, the pre-sale display in Paris featured the art in a mise-en-scene that evoked their eclectic approach to decorating without referencing the domestic interior. Kirill Istomin’s concept for his Christie’s viewing salon. Rendering: from Architectural Digest, courtesy of Kirill Istomin. But the idea of the domestic interior sells–especially in a marketing environment where social media dominates. Christie’s recently announced that it would create a viewing salon for its Important Russian Art sale in London on November 25, 2018. They have hired Russian-born designer Kirill Istomin to create a “selfie-ready salon” for the works in the sale. 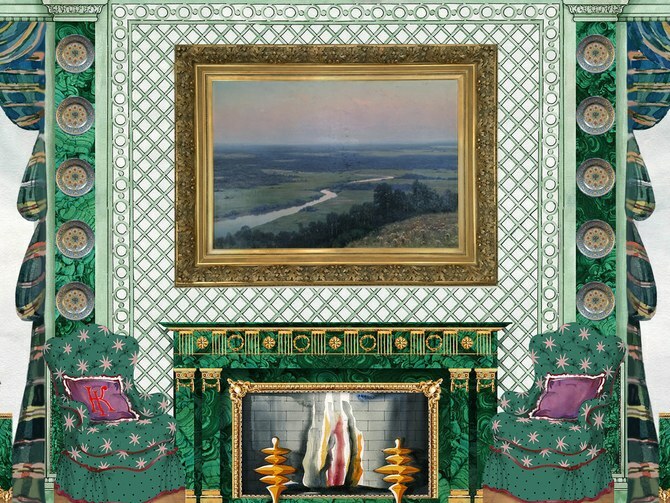 According to the designer, “the idea behind our collaboration with Christie’s is to compose a site-specific interactive salon within the auction gallery, to breathe new life into the traditional auction preview model.” Readers of Home Subjects will know about the tangled history of auctions and the domestic space, especially as revealed in a post by Diana Davis. It remains to be seen whether or not this trend will spread to other auction houses and other spaces, or give renewed impetus to the period rooms and integrated displays of painting, furniture, and decorative arts at museums. Perhaps it will depend on whether or not they allow photographs.